Are you one of these guys who always struggle to come up with unique and astonishing gift ideas? Well, I am for sure. But hey, there is an online store for us. At LatestBuy you can find a huge range of unique gifts and fantastic gift ideas for Her and Him and Baby, too. 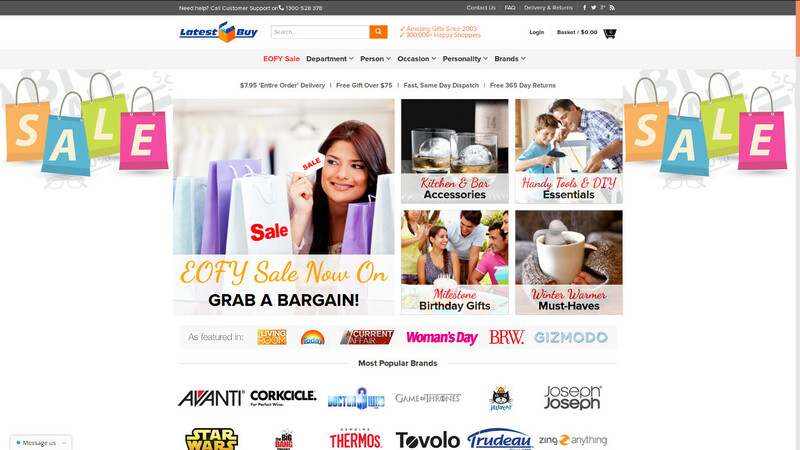 Check out this page regularly and you will never miss another great sale at LatestBuy again. Imagine two brothers eager to set up their own online retailing business. Shaun and Darren Campbell shared this dream back in 2003. And they were fed up with endless hours wasted to find the perfect gift. That’s when LatestBuy was born. These days, LatestBuy is one of the largest online retailers of unique gifts all over Australia. In 2011, LatestBuy was named _Best Retail Business_ at the CEBA Small Business Awards. What makes LatestBuy special is their amazing range of gift products. Represented across 13 main categories, customers will find outstanding gift ideas for men, women and the little one’s too. Gift ideas range from Gadgets and Gizmos, Office & Tech, Home & Living to Toys & Games, Outdoors & Camping, Fashion & Beatuy and, of course, Kids & Baby. Among LatestBuy’s topsellers are amazing products such as a Push RFID Wallet, Star War Light Saber Room Lights, a The Walking Dead Jumbo Beach Towel but also handy stuff, e.g. a Car Seat Storage Organiser and this LED flashing Dog Collar. It’s just fun to poke around LatestBuy’s online store! Easy online shopping means no tricks and hidden fees. At LatestBuy, you can expect to pay $7.95 for delivery of your entire order. Neither the number of articles purchased nor their dimensions cause unexpected delivery costs. Word. Some 300,000 shoppers can’t be wrong. Serving customers since 2003, folks at LatestBuy have made it their mission to provide you with the most convenient shopping experience possible. To emphasize their ambitious promise, co-founders Shaun and Darren give you their unique Customer Guarantee. For example, LatestBuy guarantees to add at least one new product each and every day to assure your can always buy a unique gift. We have already mentioned that a delivery flat fee will be charged, irrespective of order size. Staff at LatestBuy strives hard to handle your order, requests, and even returns as quickly as possible. Friendly communication is assured by a national customer service line, where you can talk to a ‘real’ person. But there is one more thing: If you are, for whatever reason, not satisfied with the product you have bought, you can return it within extraordinary 365 days after purchase! Yes, 365 days, that’s amazing, isn’t it?! That is what we at CouponDeals.com.au call real love for their customers. Postal Address: PO Box 8384, Perth Business Centre, PERTH WA 6000, Australia.